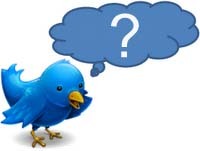 What does an @ message in Twitter mean? The @ sign is used to have public conversations with your friends on Twitter. It’s kind of like a public instant message or text message conversation. If I want to get someone’s attention on Twitter I will put an @ sign in front of their user name before typing my tweet. They will then get a notification that I’m talking to them. The tweet will also include a hyperlink to their Twitter profile so all my friends on Twitter will see who I’m talking to (or about) and if they are curious who that person is they can click on the link and check out their page and follow them if they think that person looks interesting. It’s a great way to meet friends of friends. For instance, just now as I’m writing this a Twitter friend @JustinRyan was talking to someone else about a past blog post I wrote. He was talking (tweeting) about me and used @Sally_K so I was able to see that he was talking (tweeting) about me and respond to him with the blog post link he was referring to. When someone sends you an @ message on Twitter. It is polite to respond. I know the big Twitter users such as @TheEllenShow or @Oprah may be overwhelmed by the amount of @ message they receive but Twitter is for building relationships not just broadcasting yourself so unless you are a superstar that doesn’t have time for the little people I recommend you start using @ messages and try to respond to any @ messages your receive.